Click here for a larger view of University Ave.
University Avenue may be the least wild place in Toronto, with eight lanes of traffic running between great walls of stone and concrete. But it’s a landscape. Look around: On the islands in the boulevard, lawns, copses, planters, fountains and benches form a modernist tapestry all the way from College to Richmond Street. To Charles Birnbaum, this is a valuable piece of history, a work of design with “a pedigree that doesn’t exist anywhere else in Toronto,” explains Mr. Birnbaum, the head of the Cultural Landscape Foundation. Speaking from his office in Washington, he enthusiastically runs through the history of those traffic islands: The landscape designer André Parmentier planted the avenue in 1829; it was reshaped in the 1920s in the Beaux-Arts style; and in the 1960s, the current landscape was designed by the British-born architect Howard Dunington-Grubb to cap the newly built subway. It includes perennials, statues and vent stacks. Their effort in Toronto – which includes online guides, walking tours and a conference in late May – is timely. TCLF, with a group of local professionals and scholars, hopes to open our eyes to this aspect of our heritage, and to how landscape architecture is changing the city’s face. That is happening on a large scale: Along Lake Ontario, Waterfront Toronto is building a series of contemporary landscapes that, with their scale and quality, are setting a global example. The first hurdle is awareness. What exactly is a “cultural landscape”? It can be a street or a waterfront, designed or inherited. But most often it means a designed outdoor space, the work of landscape architects who deal with urban and ecological lenses, as well as vegetation and the formal design of plazas, streets and other outdoor spaces. Click here for a larger view of Trinity Bellwoods Park. From 1851 to 1904 it was the campus for Trinity College, with a creek running through it. Garrison Creek now runs through an underground pipe, and a bridge that once spanned it on Crawford Street is buried under the grass. How, then, should such a park be treated and maintained? With some thought to its history, the same way we treat buildings we’ve deemed historic. Landscapes change – they have to – but we should understand what we’re doing when we alter the design of a place. In Toronto, TCLF has worked with Ryerson University students and professor Nina-Marie Lister to produce a local version of What’s Out There. This is a guidebook, to be published in print and digital form, to landscapes and neighbourhoods from Leaside to Nathan Phillips Square. Walking tours, the weekend of Doors Open (May 23 and 24), will help introduce this history. Yes. And by looking at the full range of designed landscapes here, “you see that this city has an important legacy,” Ms. Lister says. “You start to see the resonance to Chicago and Montreal,” where specific parks form a central part of the urban identity. That may be the case in the Toronto of the future, too. The city has been a hub for thinkers and scholars of landscape architecture for decades – Mr. Birnbaum cites the late Michael Hough, whose obituary I wrote in 2013, as a figure of international renown. Now they are playing crucial roles as cities try to rebuild themselves for the 21st century. Especially here. The key is Waterfront Toronto: In remaking 800 hectares of the industrial waterfront, that agency has brought together some of the best landscape architects in the world to remake the topography and to set a high standard for the urban fabric it is building. 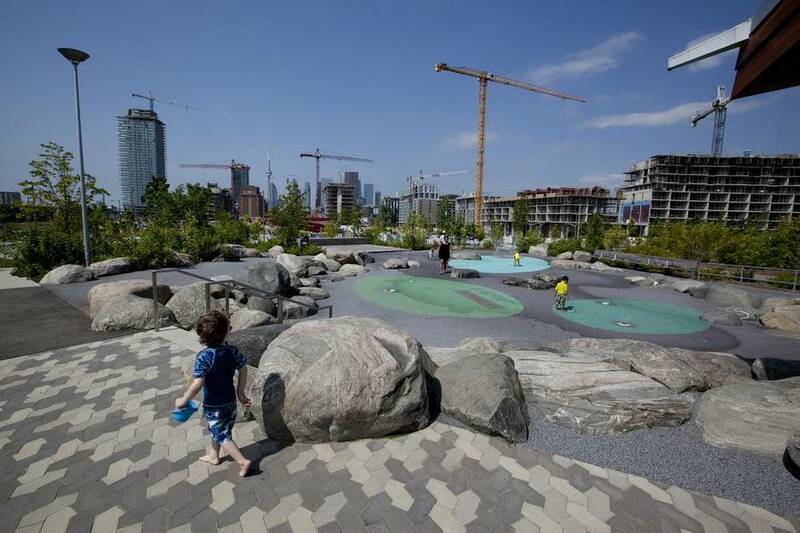 New parks work as both open space and infrastructure. Michael Van Valkenburgh Associates’ Corktown Common, for instance, includes a berm that will protect downtown from floods of the Don River and a wetland that absorbs stormwater. It’s also gorgeous. 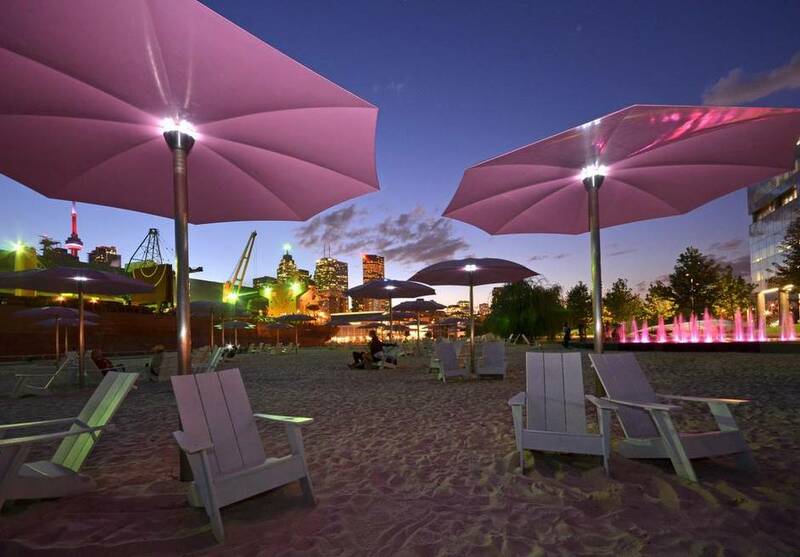 So is Sugar Beach by Claude Cormier, which I believe will become one of Toronto’s most beloved outdoor spaces. This series of achievements is still invisible to most Torontonians. For those in the field, however, the scale and quality of what is being built here is very clear. “This is some of the best contemporary landscape architecture anywhere in the world,” Ms. Lister says. That will happen May 22, at a conference called Leading with Landscape that will bring leading architects and scholars from around the world to talk about Toronto’s fabric – how the city is defining a new body of parks and public space, and defining a new identity. The speakers will include Ms. Lister, Toronto chief planner Jennifer Keesmaat and designers including Mr. Cormier and Adriaan Geuze, whose West 8 studio is part of the winning team for the Jack Layton Ferry Terminal. Part of the discussion will be how to think about Toronto’s parks and open space, including potential new models for managing and stewarding them. That is an important discussion in a city where beloved parks don’t always get the care or thoughtful attention they deserve. But the first point is to get people engaged: “This is about making meaning for the city,” Ms. Lister says. The places where we gather define us, even if we don’t see the landscape for the trees.